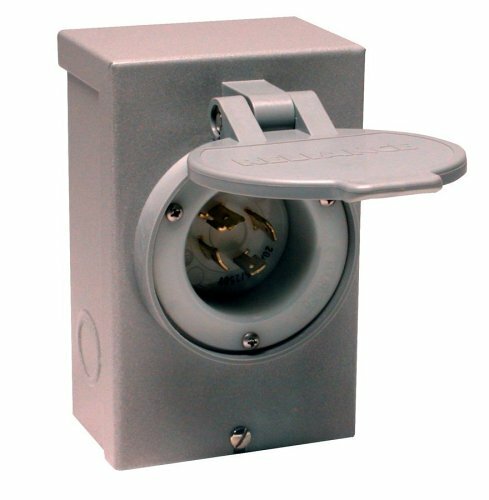 The Reliance Controls PB20 NEMA 3R Power Inlet Box is an outdoor/watertight electrical inlet for a 20 Amp L14-20 generator cord. It is designed to be located outdoors where the generator is running to prevent dangerous carbon monoxide fumes from the generator from entering your house. This inlet box is then safely hardwired through an outside wall directly to the transfer switch or panel, eliminating the need for cords running through windows or doors. It is designed to be wired directly to the transfer switch or panel by using one of the four combination 1/2-inch and 3/4-inch knockouts (one on each side, bottom and back). The exclusive patented design provides generous wiring space and facilitates rough-in. The face of the box is removable for easy placement and wiring. It is constructed of steel with rugged, anti-corrosive powder-coat paint and has a spring-loaded inlet cap to prevent moisture front entering the front-mounted connector inlet when not in use.. Since 1909, Reliance Controls Corporation has contributed more innovations that any other single manufacturer and has been awarded over 85 patents on manual transfer switches, time switches and accessories. Reliance Controls Corporation specializes in the manufacturing of a wide variety of electrical products. The primary product line consists of heavy duty time clocks and controls, generator accessories, transfer switches and transfer panels for portable generators and inverters. And after over a century of innovation, Reliance Controls Corporation has built an enviable reputation for high quality, superior engineering and exceptional customer service.